Our main collections of print and e-books support learning and research in all disciplines on campus, and also include popular fiction and non-fiction, young adult, and children's titles. We have over 450,000 print books in the collection, housed on the 3rd floor and in the Automated Retrieval System (ARS), and over 150,000 e-books, available to you 24 hours a day from anywhere in the world with your Seawolf ID. If you want to know what we have that's new and notable, check out the New Book displays throughout the library. Come by often: We're always adding new materials to the collection. f you find a book that is in the Automated Retrieval System, you have to sign in in order to request the book. You'll see a blue link that says "Request." Click the green Request button in the window that pops up, and your book will be available to pick up at the Information/Check-Out Desk within 30 minutes. Do you need a book that we don't have in the Library? CSU+ makes all of the resources of the CSU libraries available to you. Change your search to a CSU+ search using the drop down menu in the search bar. 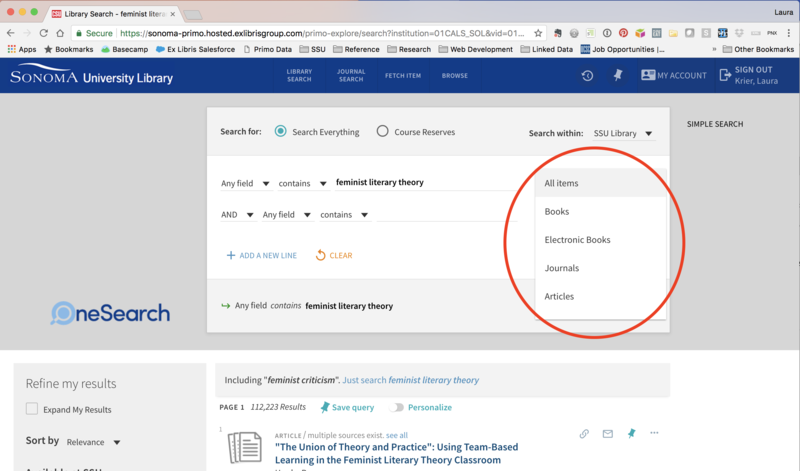 Interlibrary Loan (ILL) provides access to articles that we don't have in full text. If you're not able to link to full text, ILL will usually be able to get you the article within 24 hours. ILL can also be used to borrow books that can't be found in any CSU library. Find out more about borrowing from other libraries. The Juvenile collection contains over 10,000 items, including fiction, non-fiction, easy readers, and picture books. The Juvenile Collection is housed on the 2nd floor south. All items are available for checkout. Visit our Family Study Room if you're looking for a great place to bring your little ones. The North Bay Regional Collection provides a wide range of information about the counties of Sonoma, Lake, Marin, Mendocino, Napa and Solano. You'll find books published locally, written by local authors, and detailing the history, politics, and events of the North Bay region. Our Regional Collection is on the 3rd floor south.